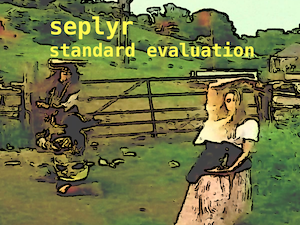 The R package seplyr supplies improved standard evaluation interfaces for some common dplyr data plying tasks. To get started we suggest visiting the seplyr site, and checking out some examples. # supplied by a user, function argument, or control file. The concept is: in writing re-usable code or scripts you pretend you do not know the actual column names you will be asked to work with (that these will be supplied as values later at analysis time). This forces you to write scripts that can be used even if data changes, and are re-usable on new data you did not know about when writing the script. Note: seplyr is meant only for “tame names”, that is: variables and column names that are also valid simple (without quotes) R variables names.